The wait is almost over – ladies and gentlemen, boys and girls, ghouls and goths, the legendary shock rocker Marilyn Manson is BACK with an all-new North American tour!! Comeing to the Stage AE on Friday 29th September 2017, this is a show no fan of the notorious king of darkness can afford to miss! Tickets will sell out fast – hit the “Buy Tickets,” button above NOW and get ‘em while they last!!! The new album id mostly being kept a closely-guarded secret. Originally scheduled for a Valentine’s Day release in 2017, and entitled “Say10,” before this title was scrapped in favour of “Heaven Upside Down,” fans were left waiting in tense anticipation of any further information. It appeared that more time was needed for the album, but Manson has recently given us an update of what to expect – along with an indication that the album is near completion! The recent news of the upcoming tour suggests that the album is close to being released, and fans should expect to preview the brand new songs LIVE on Manson’s upcoming tour! 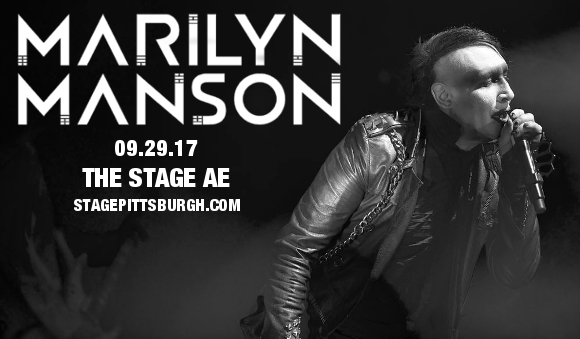 Don’t miss this incredible opportunity – book your tickets to see Marilyn Manson NOW whie they last!